On sale half of luxury semi-detached house and property in Ruka. 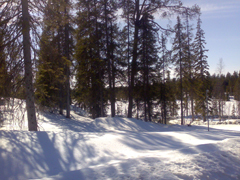 Property is near Ruka Ski Resort, the most popular Ski Resort in Finland. Location is excellent for both, winter and summer activities. House has built on small hill and just beside it there is nice waterfront, Saukkolampi. Ski track and snowmobile track are just near by the house. Downstairs there is 1 bedroom, kitchen, livingroom, wc, shower and sauna. Upstairs there is 2 bedrooms and wc. Every scheme of interior decoration is based on pure nature material, wood and stone flavoured with shine of snow, glass and crystal. Everything; interior, materials and furniture in the house are top quality and specially designed for the house and some of furniture are hand made by carpenter. Italian tiles and Finnish luxury kitchen are just one part of the feeling of the house. Black sauna with Harvia stone stove with fibre lighting makes your spare time in sauna a real enjoyment. A view from saunas window to Saukkolampi makes your time in sauna even more enjoyable. Every material used is real material. "In this house, stone is real stone, wood is real wood". Ecology has been taken care of in every material: When supplier of the house itself, doors, windows, fireplace etc. were chosen, only the best were the opition.